Low price-per-barrel for Urals crude oil is putting pressure on the Russian budget. On Aug. 18, Reuters reported that the price for Russia’s benchmark Urals oil fell to $98 a barrel — its lowest level since May 2013. Even as recently as July, Urals crude was selling for an average of more than $105 per barrel. In the last 12 months, the Urals brand lost 11.3 percent of its price; it has lost 8.2 percent since the beginning of 2014. According to experts, there are several reasons for the fall in prices. As could be expected, seasonal oil demand is down in both Europe and Asia. However, one less anticipated factor was a 25 percent increase in oil production in Libya. Additionally, increased violence in Iraq has also caused volatility in the oil markets. Oil remains the main driver of the Russian economy, and $100 a barrel is a psychologically important mark for the Russian market. Moreover, the current Russian budget was created assuming a $114-per-barrel price for Urals. “According to various estimates, the budget becomes deficit-free when a barrel of oil costs about $110,” said Ilya Balakirev, chief analyst at the UFS investment company. Balakirev explained that while the fall in oil prices is of concern, the budget does not face any serious problems at the moment, since it is based on the average price of oil, which remains over $100 for the year to date. Additionally, Russia has increased oil supplies to southwestern Asia, which buys a more expensive type of oil than Urals. In May 2014, Alexander Dyukov, general director of Gazprom Neft, the oil business of Russian energy major Gazprom, announced that the company would base its 2014 business plan on an average oil price of $111.5 a barrel, however, long-term projects would be based on a price of $95 a barrel. Therefore, in the long term, Russian oil companies appear protected. As well, the price drops are not as severe as during the global financial crisis of 2008-2009, when the price of Urals dropped from $147 to $40 per barrel between June and December 2009. Russian analysts remain hopeful about the rest of 2014. “As we approach September, businesses will increase their activities and various countries will start preparing for the new autumn-winter season and oil prices may start to go up,” said Dmitri Baranov of Finam Management. 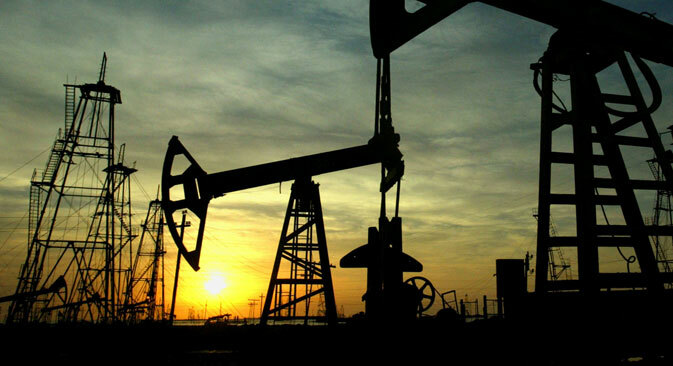 Additionally, Pavel Simonenko, director of sales to CIS Countries at Dukascopy Bank, said that Russia’s economy is becoming less dependent on oil, and the price of the resource should in future have less effect on the overall economic health of the country. “In 2013 oil and gas earnings comprised 52 percent of the overall revenue, whereas this year they are expected to be 45-46 percent,” said Simonenko. UFS’s Balakirev thinks that the Russian Finance Ministry should use the downturn in prices as a reason to look for other ways to shore up the country’s economy. Russia’s budget is drafted in the ruble, but oil revenue is generally paid in dollars. The value of the ruble against the dollar has fallen significantly over the spring and summer. With this in mind, on Aug. 18 Russia’s Central Bank announced it would completely abandon its support of the ruble by January 2015, a move that will help give more market value to the national currency. The Central Bank has actively participated in the correction of currency value, selling currency in moments of political tensions, when the ruble falls against international currencies. When Russia incorporated Crimea in March, the Central Bank sold $22.3 billion to support the ruble’s value. As tensions with Western countries caused the currency to fall even further in the spring, the Central Bank continued to act. In April, it sold $2.4 billion, and in May the Central Bank bought $1.4 billion and sold $365 million. The ruble’s value decreased, although not as substantially as it would have had the bank not supported it. According to Dmitri Baranov, from the beginning of 2013 the ruble has lost 20 percent of its historical value against the dollar. Therefore, in a free float, the ruble can be devalued even more.